It's bigger and brighter than ever, as the fourth annual Portland Winter Light Festival has spread to the west side and boasts of more than 100 artists and installations. "It's becoming a fun party for everybody," says Michelle David, communications director. "It's free, family friendly and in the heart of downtown." 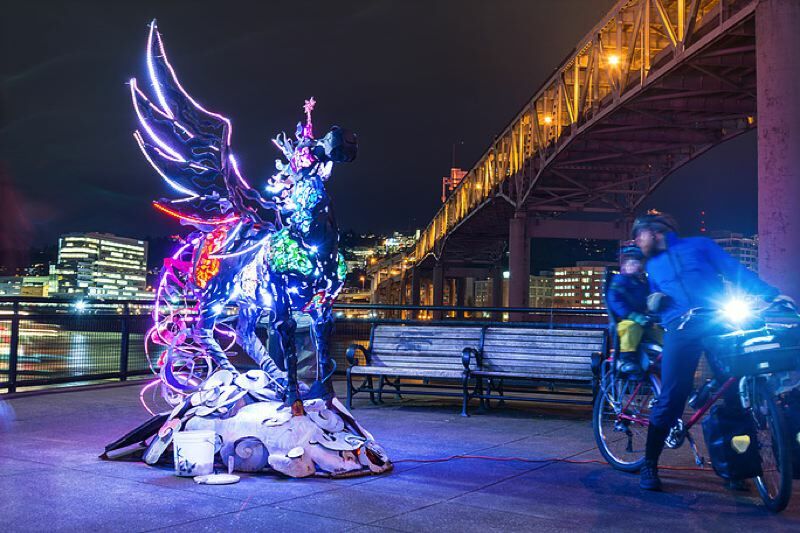 The festival lights up space on both sides of the Willamette River from 6 to 11 p.m. Thursday through Saturday, Feb. 7-9, including at Waterfront Park and on the Eastbank Esplanade. 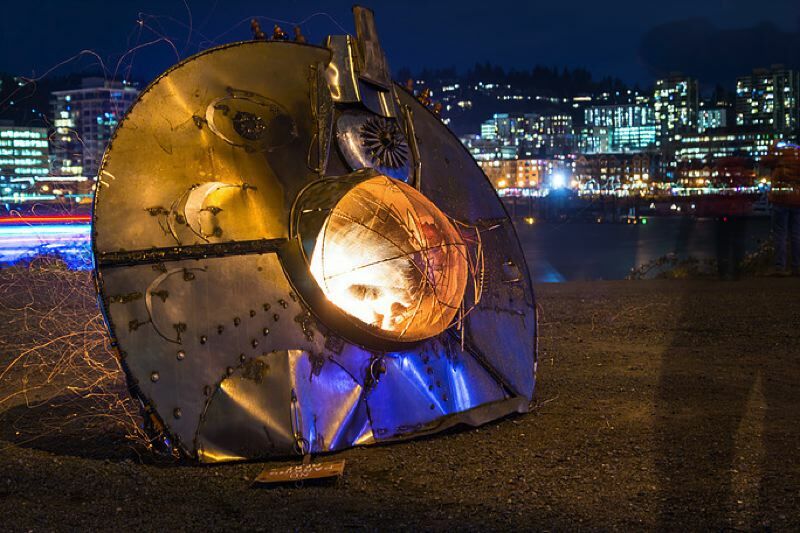 There'll still be outside installations at the Oregon Museum of Science and Industry, where the festival had been based, as well as more installations at Tilikum Crossing, the Oregon Rail Heritage Center and Portland State University. There'll also be performances, interactive activities and more. (Festival organizers encourage visitors to take public or alternate transportation because of limited parking near installations). Artists, mostly from the Pacific Northwest, range from professionals in architecture, design and technology "to people who dreamed up their first work after coming here for the first time," David says. "It's definitely inspiring people." The nonprofit Willamette Light Brigade and Portland General Electric organize the festival; it's powered by PGE renewable energy. 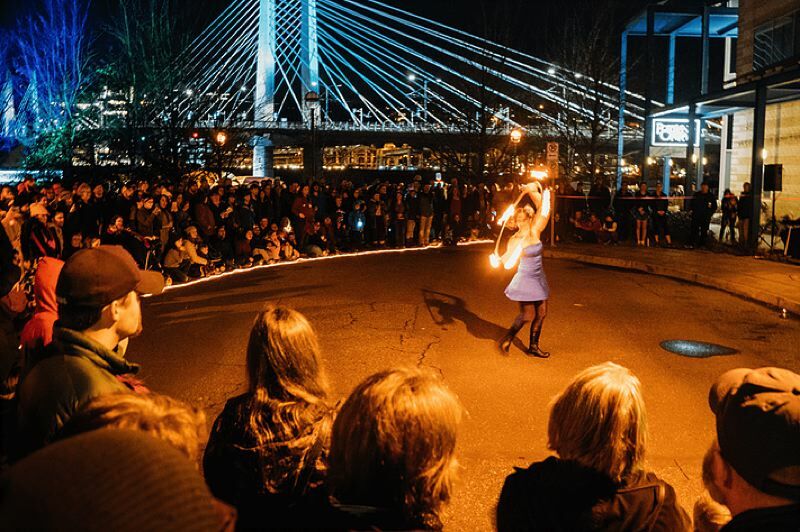 "The record-breaking attendance of last year's festival demonstrates that the Pacific Northwest has a true desire for art, connection and celebration during the coldest time of the year," says Jeff Schnabel, a Willamette Light Brigade board member and PSU professor. • There'll be more than 20 installations at PSU, including fire sculpture and large-scale video mapping. There'll be another 20 installations at Waterfront Park at Salmon Springs Fountain, including Ivan MacLean's "Mirror, Mirror on the Ball" (a 25-foot-tall disco ball with 1,600 mirrors), Cheryl Leontina's "Stories Under the Bridge" (a documentary about homeless) and EnlighTEN by Fresh Squeezed (touch-reactive LED light poles originally built for Burning Man 2018). • Interactive artworks are by the likes of Christopher Condrat ("Chromosphere," an animated sphere sculpture with 2,400 sound-activated LEDs) and Richard Cawley and Portal Arts Collective ("Cosmic Fire Turtle"). • Some popular installations are "Psychedahlia Garden" by Tyler FuQua (12-foot-tall Jurassic-size and vibration-activated flowers), "F(Light)" by Jen Fuller (150 hand-blown paper airplanes) and "Lite Brite Remastered" by ACME (8-foot-tall Lite Brite). • Along with live performers, there'll also be a lantern parade, an illuminated bike ride and a silent disco.